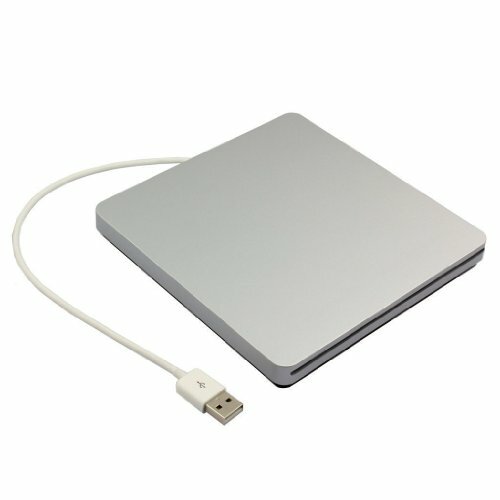 The Slim USB External Slot in USB SATA CD DVD Drive / CD Burner is special designed for the Macbook, Macbook Pro, Macbook Air or other PC/ Laptop with USB port, no enjact button designed, powered by sigal USB port from your PC/ Laptop, plug and play, full compatible with MAC or Windows os, no need to install any driver program. It is convenience for you to playing music, movies or install software with this usb external DVD drive, or copy / burning music from your laptop to a CD disc. 2. Ultra Slim and Light Weight, Classic Designed Appearance Designed. 3. Support DOS Start and System Recovery. 4. Brand New Inport Chip, Power Ability to Correct Errors, Shockproof, Low Level Noise. 5. Route Optimalizing Design for Power Saving and Low Power Consumption, NO External Power Required. 6. Easy to install, Plug and Play, No Any Driver Required(Excluded Windows 98SE). 7. Unique Intelligent Replication Technology, easy to Pause/ Record Files. 8. Automatic Slot in Design for the Disk, Prevent cockamamie process of opening or closing the machine's door by hand. 9. Compatible with All Laptop and PC with USB Port. Support USB2.0 (480Mb/sec), fully backward compatible with USB1.1 (12Mb/sec). 100% brand new,plug and play. Full compatible with usb 2.0 / usb 1.1. power by usb connector, no external adapter needed,no enject button designed, slot loading. NO driver and external power required, the external cd dvd drive is specially designed for your ultrabook, netbook or PC which don't have the drive hardware, very convenient to use in the office or on travel. With slim, light-weight and shockproof design, you can put it in the travelling bag or on your desk, which only needs a little space, easy to cooperate. If you have any questions about this product by DoHonest, contact us by completing and submitting the form below. If you are looking for a specif part number, please include it with your message.